Bernard Gehret is a multi-family real estate broker who specializes in assisting individuals and families generate sustainable wealth through real estate investing. Mr. Gehret focuses on advising clients in moving their dead equity into more effective investments, and finding high quality investment opportunities that are not often found officially on the market. In January 2006, Mr. Gehret co-founded Joseph Bernard Investment Real Estate, specializing in multi-family brokerage. The company is consistently ranked as a top commercial real estate firm by the Portland Business Journal and Oregon Business Magazine, and was a finalist for the Oregon Ethics in Business award in 2010. Bernard is also a former winner of the Commercial Association of Realtor’s “Investment Broker of the Year” award. 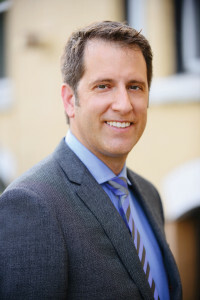 Having begun his career as an apartment broker in the year 2000, Mr. Gehret has tremendous expertise as a Commercial Broker and has closed over 300 multi-family transactions resulting in approximately $200 Million of total sales volume. Mr. Gehret values representing clients really well, and loves a “teamwork” approach to brokerage, creating successful strategies with his clients to assist them in reaching their financial and personal goals. His straightforward, calm and professional approach creates a smooth transaction for clients in an often chaotic marketplace. A strong believer in building long-term relationships with strong representation, Mr. Gehret continues to provide a high level of service to each of his clients after closing. He strives to be each client’s “Broker for life”, and provides tremendous focus and expertise in completing all deals. Mr. Gehret provides investment real estate seminars focusing on maximizing wealth with multi-family investments including the popular monthly “Apartment Investor Series” held in Portland, Oregon. He is available to speak to groups focusing his topics on increasing sustainable wealth through investing in apartment buildings. Prior to co-founding the company, Mr. Gehret was the Senior Broker and top producer for Granite Equities, LLC. He trained and mentored junior brokers, as he has a passion for reaching back and helping pull others forward. Prior to becoming a commercial real estate broker, Mr. Gehret provided sport psychology services to professional athletes. He consulted professional baseball and hockey players on performance enhancement, in addition to delivering sport psychology consultations to various collegiate and high school athletes and teams. Bernard earned a Master’s Degree in Sport Psychology from San Diego State University, and also a B.A. in Psychology from Miami University. While at San Diego State, he co-founded “Peak Performance Consultations”, a graduate student operated group that provided sport psychology services to university athletes. Mr. Gehret loves learning how to play guitar, and does his best attempting to keep up with his wife Eva and her family on long hikes and bike rides. He also loves to read, and spends way too much time delving in to the incredibly interesting men’s fashion blog The Parisian Gentleman.